One of the leading ideas on how to implement a basic income is a social wealth fund, similar to Alaska’s Permanent Fund, in which a government maintains a fund of various assets and provides dividends to everyone who lives within its borders. 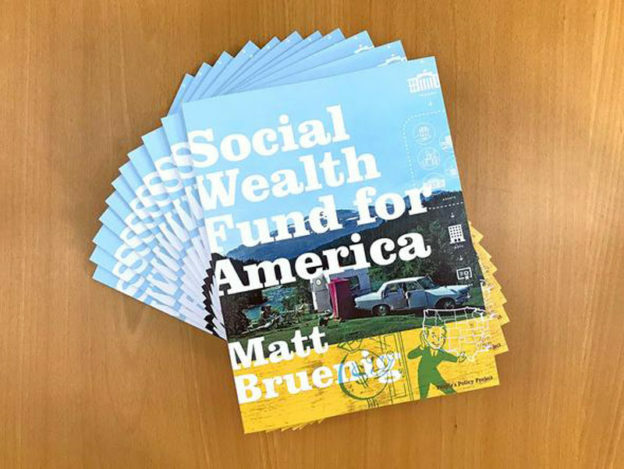 Matt Bruenig, President of the People’s Policy Project, recently designed a detailed proposal for implementing a social wealth fund in the US that would be financially and politically stable. He spoke with Jim about how he crafted this design and how he plans to advance it. Jim: And I’m Jim Pugh. Owen: One of the leading ideas in the basic income space right now is a social wealth fund similar to what’s going on in Alaska, where they take state revenue mostly from their oil funds and provide a universal dividend to every person there. Jim: This idea has been taken and built upon and looking at whether potentially it could be replicated both in other states and also potentially ultimately at the national level where we could actually have this big fund that’s paying out these universal dividends to everyone in the country that might, at some point, actually start to approach a full universal basic income. Owen: One of the big thinkers on this topic is Matt Bruenig. He is the founder of the People’s Policy Project. He recently published a very detailed expansive proposal for a social wealth fund for the entire United States. Jim got to sit down with Matt Bruenig and discuss his proposal. Jim: Matt, thank you so much for joining us on the program. Matt: Thanks for having me. Jim: Now, in late 2017, you wrote a piece in The New York Times about a specific model for financing a universal dividend program, which you dubbed a social wealth fund. We’ve actually talked a few times about social wealth funds on the podcast in the past, but just to make sure that everyone is up to speed, can you generally explain what a social wealth fund is and how it works? Matt: Yes. In its broadest definition, a social wealth fund is a collective pool of generally financial assets that is owned by the government, and the return on those assets is used for social welfare purposes. In my specific version of a social wealth fund, the government creates a new fund, gives every person in the country one share of ownership in the fund, then it fills the fund up with assets. As those assets generate a return, that return is then paid out to the owners of the fund, which again, is everyone in America who would own one share of the fund. That’s the basic model for my particular implementation of the general idea. Jim: On that note, you released a quite extensive and specific proposal last month for the creation of an American social wealth fund, which you dubbed the American Solidarity Fund. Can you tell us more about what specifically is in that proposal? Matt: Yes. It is, like I said, in broad strokes, the government will create a new fund, I call it the American Solidarity Fund. It will also create a new management company, which will be a government corporation. That management company will be charged with running the fund, basically investing it just like any asset manager does in the private sector. Every American would be given one share of ownership in the fund. Every year, they would receive a dividend based on the returns on that fund. The biggest, I guess, question mark that the paper tries to answer is, how do you get assets into the fund in the first place? We know how to basically run a fund. It’s just like a pension fund or a mutual fund, it’s not a complicated thing. We know how to pay out dividends to people. That happens again, in the financial industry all the time. It also happens that the government sends out checks to people quite regularly, whether Social Security or similar, but the big question is, how do you get money into the fund? How do we get assets building this fund? The paper proposes a number of approaches to that. One is leveraged purchases, meaning that the government will basically borrow money and then use the money to buy assets and since the interest rate on government debt is lower than the rate of return that you generally get by investing in the stock market or similar, they could take advantage of that spread and make money. Another approach is called monetary seniorage. The basic idea is right now, when the Federal Reserve wants to increase the money supply, what it does is it creates new money, and it goes out and buys treasury bonds. Instead of buying treasury bonds, it could go out and buy any sort of asset including stocks, bonds, real estate. In fact, the Bank of Japan has been doing this with their central bank for the last 10 years or so. Finally, taxes, good old fashioned taxes. I have all sorts of taxes. Taxes on initial public offerings when a company goes public, taxes on mergers and acquisitions, taxes on fund management, financial transactions taxes, et cetera, et cetera. Basically, targeted taxes on the wealthy, the revenues which could go to fill up this fund then create assets that we all own an equal share of. Jim: Now, you used the Alaska Permanent Fund as a general model for the American Solidarity Fund. Revenue there comes specifically from oil in the state, but as far as, once the fund’s in place, they invest that, people get the dividend, very similar model. But one potential distinction between the two is how fund investments might be used to influence corporate behavior. The Alaska Permanent Fund is completely passive. The shareholder voting rights conferred by their investments are not used at all. But for the American Solidarity Fund, you suggest that those voting rights could potentially be used to exercise public influence, either by representative voting or more directly by some manner of popular proxy voting. What motivated you to include that design component in your proposal? Matt: You’re right. I believe that Alaska doesn’t take a very activist stance with its holdings, I’m not sure if it ever votes on shares, or if it ever has negotiations with company directors, but the Norwegian Fund or funds that I covered in the paper, they take the opposite approach. The Government Pension Fund Global, which is their big $1 trillion wealth fund, they vote on almost all the shareholder votes. They have thousands of meetings a years with company directors, trying to influence company behavior so I adopted that model. As to why, my goal in this is not just to reduce wealth inequality, is not just to reduce income inequality through the basic dividend, but also to socialize control of companies to some degree. If this fund doesn’t vote its shares, then you have to ask yourself, “Well, what shares are going to be voted,” and the shares that are going to be voted are whichever ones are still held by private owners. Realistically, the private owners of financial assets and especially shares, those private owners are very affluent people. I’m trying to counteract their influence over our economy and make it to where we have more social control over the economy, in addition to leveling out wealth inequality and leveling out income inequality. Jim: Something you just touched on, which is I would say fairly unusual about your proposal, is that you are aiming to tackle wealth inequality, not just income inequality. In my experience, people’s understanding of wealth inequality, and how that differs from income inequality is often quite limited, even amongst those who work on these sorts of issues. I realize this could probably take an entire episode in itself, but can you briefly talk about that distinction, why it matters, and what implications it has for policy design? Matt: Yes. I think you’re right that oftentimes, actually, you’ll find people use the word wealth and income interchangeably or they’ll use rich and wealthy interchangeably, even though these are somewhat different concepts. In broad strokes, wealth is what’s in your bank account, if you will, and income is what’s in your paycheck. Or another way to put it as wealth is the stock of things you own and income is the flow of money that you get on a periodic basis. The importance of wealth inequality, there’s so many things that are important about it, but broadly speaking, wealth equates to power in the economy. Whenever people are appointing boards of directors on companies, the way that works is the shareholders get to do that. Well, who owns shares in US companies? If you look at Federal Reserve Surveys, they show that around 90% of company shares are owned by the top 10% of Americans. This is a huge layer of basically societal management that’s occurring at the corporate board level. We have thousands of companies and tens of thousands of board members, and they’re managing production on a day to day basis. Who appoints those managers? The really relatively small slice of the public, the wealthiest people in the country. If you have a more egalitarian mindset, you got to be focused not just on making sure people have enough money to buy basic necessities and food and housing, but also, you want to try to shift power in the economy so that the direction of the economy is not being governed by a small slice of people. For that, you also have to make sure wealth gets spread out, and so the social wealth fund is my approach at doing that. Jim: Unlike most other proposals that aim towards some universal basic income, which is what you see this could potentially reach if enough wealth were moved into the fund, when the income is taking the form of dividends from a collectively owned asset pool, you have more potential to instill a sense of ownership amongst people than if it’s just a regular transfer. I know that’s something that was important in your proposal — can you say what role you see that playing if this policy is enacted? Matt: Yes. One of the things that you have to think about when designing any kind of program in a democratic country is the recognition that at some future point, the government is going to be controlled by the other side. Whatever side you happen to be on, it’s going to be controlled by the other side. You have to design programs that are going to be sticky or resilient in the face of government that maybe does not like them. Social Security is a good example of that. Republican thought leaders and the think tanks, they often write very negatively about Social Security, but you notice when they get in power, they don’t ever seem to do a whole lot about it. The dividend structure and the wealth fund structure is designed with that in mind because the idea is if you give people a share of this fund, if you say, “Look, you own one share of the American solidarity fund” and in the paper we even marked up an app where you can see your share, and you can watch it grow over time, just like you might check your 401(k) or whatever. If you get it in their hands and impress upon them that this is your wealth, you own it, then I think it becomes a lot harder for someone to come around and take it from them because then at that point, it feels like you’re being stolen from. Like a cut in a basic income that’s more conventional basic income policy, it’s just like, “Well, that’s a cut in benefits.” Or a cut in taxes, say, “Well, that’s just a cut in taxes,” But taking my dividend, taking my share of ownership, you are stealing from me or legitimately taking an asset from me that I own. I think that’s going to be a lot harder to pull off for politicians that care about public approval. Jim: I’m curious, particularly in your choice of naming for the fund, calling it the Solidarity Fund. Is that a component you also see with the ownership aspect, that this is something that would make people feel like they’re more tied together with one another? Matt: Yes. I chose the name for a number of reasons. There’s a French fund and tax that uses the word solidarity or the French equivalent of it. That was motivating, but also generally, the idea of solidarity is we’re all in this together, we’re all going to share. An injury to one is an injury to all. It’s trying to conjure up that notion, which is different if you want to go back to the French Revolution slogans of equality, fraternity, liberty. It conjures up that fraternal notion of like a collective enterprise that we’re all part of. As opposed to a more atomized understanding of an individual entitlement that is separate from a collective enterprise. Jim: With the release of this proposal, not everyone has immediately loved it. You’ve had a few people who have raised concerns and critiques. What have been some of the most common pushbacks that you’ve gotten on the proposal? Are there some of them that you think have merit? If not, what are the ones you’re getting that don’t make sense, for whatever reason? Matt: It’s a little hard to categorize all of them. I would say, a good critique that is in most of the criticisms or implied in most of the criticisms is that this is not the most important issue. The US, we still have 30 million people who don’t have health insurance, for instance. That’s a more pressing issue, if you will, than this. I would tend to agree with that. We have a lot of issues that are perhaps more important than getting a fund built, but I never said it’s the most important policy, I guess, would be my response to that. That’s just an ideological critique. We can agree to disagree on whether a private ownership is the best model for how wealth should be controlled in the economy. If you understand it as a kind of a market capitalist Frankenstein creature, if you will, and you’re very left wing, you might say, “This is a sellout. We need real socialism, and this is not real socialism.” I’ve certainly got my fair share of that online. It is an interesting proposal in some ways because it does straddle the line. If you want to look at it a certain way, you can say, “Hey, this is advocating that wealth be socialized into a central fund that everyone owns. Isn’t that collective ownership of the means of production? Isn’t that what Marx is going on about?” You can also look and say, “Hey, this is just a mutual fund. This is just shares, this is just finance and financial assets. Isn’t that what capitalists and libertarians, isn’t that what they’re all about?” You can view it how you want to view it. I found people who have viewed it both ways and therefore it’s gotten attacks from the left and attacks from the right, based on this different way of looking at it, depending on how you twist your head. Jim: I will just say, following the conversation online, I’ve seen both of those attacks as well. So now that this proposal is out there, what do you see as the next steps for how this policy can move forward? Matt: Realistically, the way a think tank proposal makes waves is you get a politician to adopt it. We’re going to have a pretty new Congress coming up soon. It seems a lot of seats are going to change hands and a lot of new people are going to come in, especially Democrats. I don’t expect any Republicans are going to be interested in this proposal. Depending on the ambitiousness of some of them, and who’s looking for fresh ideas, fresh things to associate themselves with, maybe I can get one of them to pick it up and maybe I can get one of the existing politicians to pick it up. That’s the basic move from this point. It’s been covered in a lot of media outlets, it’s out there in the policy wonk sphere such as it exists in DC, and the only step forward really is getting a politician behind it. I suppose the other alternative is some vast movement, but I don’t think I’m capable of leading something like that. That’s where I’m focused at this point is finding a friendly politician who wants to do something bold and seeing if they’ll adopt the ideas their own. Jim: Well, Matt, those are all the questions that I had. Anything else you’d like to add? Matt: Yes, I guess it’s worth mentioning if we didn’t cover it already that there’s a distinction between people who want to use basic income to replace the welfare state and people who see it as a supplement to the welfare state. I view a basic dividends in the second pot. The goal of the basic dividend is not to replace Social Security or public health care or things like that, it’s to compliment it. That’s in part why I’m trying to get the money from capital income as opposed to trying to redirect existing tax income. I know that’s a big tension in this world and so this is more on that side. The UBI as supplement as opposed to UBI as replacement. Owen: That was Jim Pugh and Matt Bruenig on the Basic Income Podcast. One thing I found fascinating about that was just in how much policy making you can do within revenue generation and the details of the fund itself. It’s not just come up with money from somewhere. You can really in some ways remake the country or a significant portion of it through how you collect that money and distribute it. Jim: I think that’s absolutely true, and I think it’s an area that people have not actually spent nearly as much time as they should because, as you say, where money comes from — that can be as important as what you’re doing with it. When we talk about these ambitious new proposals that Bernie Sanders and other folks are throwing out there, the conversation is almost never on that. There’s these few main buckets of, “We’ll take the money from rich people or from corporations.” Maybe that’s higher income taxes, maybe that’s higher corporate taxes, but there isn’t much thinking generally, at least that has made it up into the bigger conversation, about some of these more creative approaches for how we might fund the big things and also how we might tap into the massive wealth that’s out there. Owen: I really like his concept of everyone having a share because it provides that sense of ownership. Just with the recent examples of Finland and Ontario both of– with Finland trial supposedly not going to continue past its current plan and Ontario may be canceled at some point soon. Both of those are just because a government that was not sympathetic to basic income came in. When he was started talking about how you have to plan for when a government that doesn’t like this plan takes power because that will inevitably happen, the fund itself or whatever it is has to be politically resilient enough. I liked how much thought he put into that. Jim: I think that points to something, which often gets overlooked in policy conversations. Which is that when you’re designing a policy, you can’t just be thinking about the immediate economics. If you really want something that’s going to stand up in the modern political context, you need to be thinking about what are the politics of the day? How is this going to proceed? What is the psychology people are going to have as a result of this policy? Those are all really important factors if you’re going to actually be able to create something, A, that passes, and B, as you say, that doesn’t get torn away when something shifts with the political winds. Owen: I just thought it was a good reminder because my general attitude has been like, “Well, once people are getting money that’s going to be incredibly popular,” but we saw in our episode with Bill Wielechowski in Alaska that he’s saying, “Yes, getting money is popular, but that fund is always under threat,” the Alaska Permanent Fund. Yes, the popularity of the program is what sustained it up until now, but it is something that you can’t just take for granted. Jim: I also thought it was really important that Matt shared his views around how this is tackling wealth inequality beyond just income inequality and income insecurity. That is something that I think needs– I think there’s a lot of value in having that be part of the basic income conversation, to a large degree because a lot of the push-back that we’ve had around basic income from– at least from folks on the left, is that this isn’t actually tackling underlying dynamics with the way our economy works today. If this is just papering over a lot of these underlying issues of who is making the decisions in our country, then the basic income alone may be treating symptoms and not actually the roots of it. Tackling something like wealth inequality may move us in that direction and may allow us to then build alliances with a lot more folks who are concerned about that. Owen: I thought he made an excellent point that income and wealth are often used interchangeably when it’s really not true and that so much of the value, the money out there would be considered wealth instead of income. To address inequality itself, the actual inequality between people you do need to not just go after income but also go after wealth. I appreciated his proposal for that as well. Jim: One last thing: I thought it was good towards the end of the conversation that this came up that Matt himself admits this isn’t supposed to solve all the problems. This is a policy that potentially could be pretty transformative, but on its own, it’s not going to make everything work and in fact, may not be the most high priority policy in this moment. Something like universal healthcare, you could very well argue that that is a more urgent thing to be pushing for in this moment, but that this could do a lot of good and that it could set us up in the future to be able to better figure out where we go from there. I think that’s something so often in policy debates, we pigeonhole ourselves or our opposition with saying, “Does your policy do everything? No, all right, well, we shouldn’t talk about that let’s move on the next thing.” I think instead we should say, “Does this help people and does this position us to do more?” I think from that respects, I feel like the social wealth does have a ton of potential here. Owen: Alright, that’ll do it for this episode of the Basic Income Podcast. Thank you to our producer, Erick Davidson. Please rate us, review us, and subscribe on the podcast service of your choice, and tell your friends. We’re always looking for more people to join in this conversation. See you next week. This entry was posted in and tagged alaska for america, basic income, basic income podcast, social wealth fund, ubi, ubi podcast on October 10, 2018 by owenpoindexter@gmail.com.